Are you a UK charity looking for a bespoke minibus customised to meet your needs? Running a charity is all about caring, and wanting to do the very best for those who rely on your services - so just imagine what you could do if you had your own form of transport, specially tailored to meet your requirements and the needs of the people you help. A charity minibus can vastly increase the difference you make in improving people's lives, expanding your ability to reach people and increasing your offering by providing transport and travel to the people who need it the most. At Minibus World, we have years of experience providing bespoke minibus solutions to the UK charity sector, helping you to provide an essential service for the people who are the reason why you do what you do. We have a huge selection of quality new and used charity minibuses for sale, as well as offering contract hire or leasing options at the best prices in the UK! Our long experience in the charity minibus business has taught us that off-the-shelf solutions don't suit everyone, however, as the needs of all charities are different. This is why our expert team of professional, onsite engineers specialise in sourcing, custom-building and converting minibuses to your individual specifications. If we don't have a charity minibus in stock to suit your needs we will find one for you. Every charity has its own requirements and uses for a minibus, which is why we supply a range of top quality small / medium / large minibuses to suit your needs, which we can supply as standard or convert to make them wheelchair accessible for you. We will discuss your requirements thoroughly with you and take the time to understand your needs. Following these consultations, we will design and customise your minibus to order, with a seating plan of your choice and wheelchair accessibility as required. And a wide range of other solutions for the people you help and their carers. It can give whole families the freedom they need to enjoy quality time together, or give groups of young or old people opportunities that they may not otherwise be able to enjoy. It brings people together and puts your charity firmly at the heart of the communities you serve. We can also customise your minibus further with a step, lift / ramp access, grab poles, courtesy panel, cages and signwriting, providing you with a completely bespoke and comprehensive solution that improves your charity's offering and enables you to spread your message much more easily and effectively throughout communities. If your needs change, you can always get in touch with us - our minibuses are built to be adaptable, and we will always go to every length to provide you with a custom solution that works for your charity at every stage. At Minibus World, we understand and respect the valuable work you do in improving the quality of people's lives. That's why we believe in offering you the freedom you need, with plenty of options that enable you to access the minibus you need at a price that's right for you and your charity. We offer an excellent range of quality new and used minibuses for sale to charities throughout the UK - off-the-shelf models are available with three to 17 seats, or we are always happy to provide you with a custom solution to meet the unique needs of your charity. We believe in keeping quality high and prices low - we won't be beaten on price on a like-for-like basis! If you don't want to commit to buying your own minibus we offer contract hire and lease options, enabling you to access the transport you need whenever you need it. 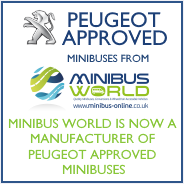 We pride ourselves on offering the cheapest minibus lease deals in the UK, with a low initial outlay and fixed, affordable monthly payments that enable you to manage your budget easily and offer you the freedom of a minibus without the long-term commitment of a purchase. Our team of expert engineers are highly experienced and complete all work to the very highest standards - your safety and comfort are our primary concerns. We complete a thorough 100+ point check on the used minibuses we sell, and will only sell them if they have low mileage and meet our stringent standards of safety and quality. We deliver nationwide, and help you to keep your minibus on the road by providing servicing, warranty and repairs in your local area where possible, thanks to our excellent relationships with providers throughout the UK. What if I don't have a bus driving licence? That's not a problem with Minibus World's CanDrive EasyOn Minibus - a model designed specifically to be driven on a car licence, subject to conditions. Our friendly team will be happy to provide you with information about this model on request. 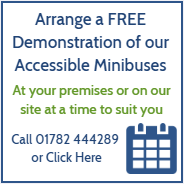 A free demonstration of any of our minibuses is available at our site in Stoke-on-Trent or your charity's premises on request - please get in touch with us to arrange this, or to discuss your charity's minibus requirements. Our specialist team are happy to talk to you on 01782 444 289. Alternatively, browse our selection of charity minibuses here, and take that all-important step towards making an even bigger difference to people's lives!